Well, this started when an officemate of ours resigned. Our office agreed to give her a Starbucks Memory Tumbler, with a photo insert. I volunteered to do a collage layout of office pictures for the tumbler. It was kinda crude at first, because I was just guessing the dimensions of the tumbler, but it looked great, and everybody loved it! And so when another officemate of ours resigned, we gave him a Starbucks Memory Tumbler too! Again, I was the one assigned to make the insert, and this time I was ready. I did some Google-ing and found a template for the tumbler! Yey me! Click here for the bigger picture. 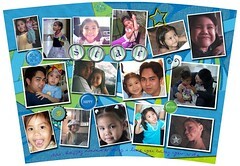 This is a very simple collage done in Photoshop. 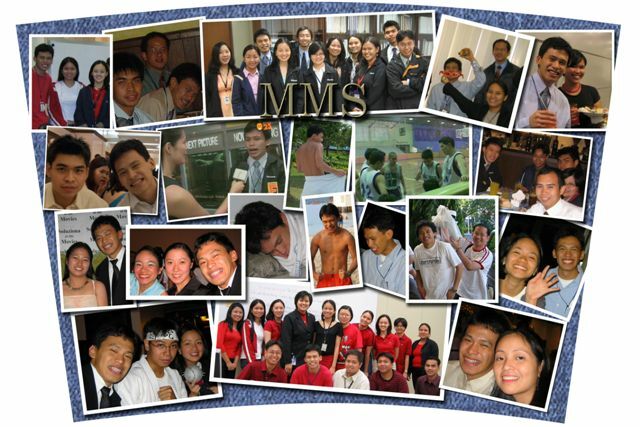 I just cut the pictures, gave them a white border [don't ask me why but I really love it when the pictures have a white border], and laid them out using the template as a guide. The denim fabric as a background was found using an image search in Google. And so I was hooked. I wanted a tumbler of my own! 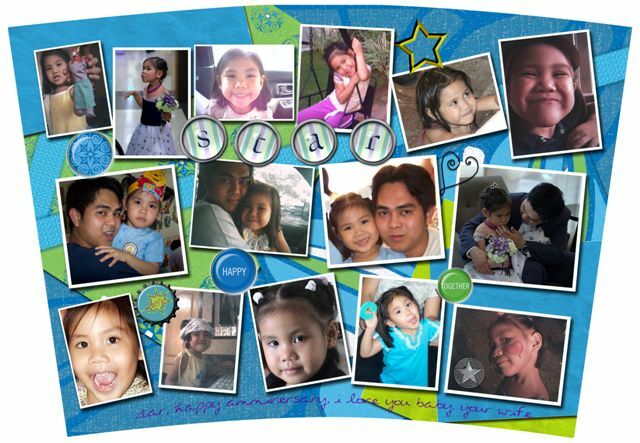 And I wanted to do more layouts and collages! 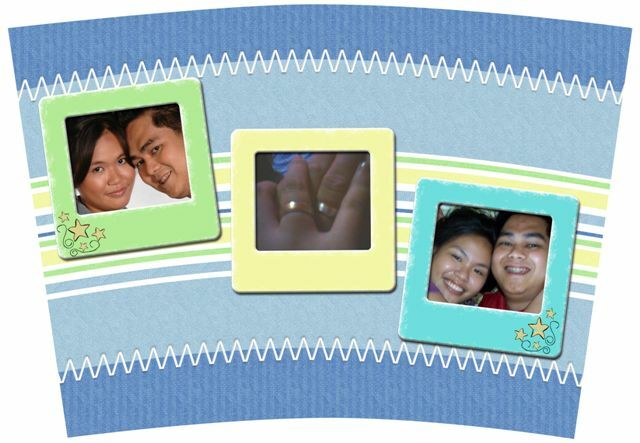 I had so many pictures to use (from the prenup, wedding, honeymoon) and I've collected so many digital scrapbooking kits already -- now I can use them to create layouts for the tumbler! Click here for a bigger picture. Background papers and blue and green pebbles from Happy Together Kit by Katie Pertiet. "Wow" bottlecap from My Retro Kit by AJW. 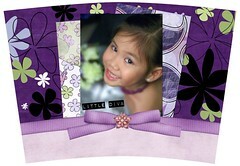 Blue ribbons by Hetty Deboer from the DigiDivas RetroKit. Alphas from the Groovy Kit by Kellie Mize. Silver star from Seeing Stars Ding-a-ments by Suzanne C. Walker. Gold star from Lullabye Kit of Sarah Barber. Black wire heart from Create Page Kit by Lauren Bavin. 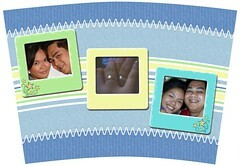 He's been using that for a month now, and mejo nagsawa na siguro, so he wanted me to do more layouts. Here are two more tumbler inserts I've done for him, but I haven't printed them out yet. 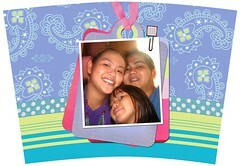 Background papers and photo slides from Soft Sherbet Kit by Heather Roselli (from thedigichick). Zigzac stitching from Like Magic Kit by Valerie Fowler (from thedigichick). Digiscrap elements used from "Mishmash Collection" by Sara Carling. Since I was so happy with the ones I made, I bought another tumbler, this time for my parents! 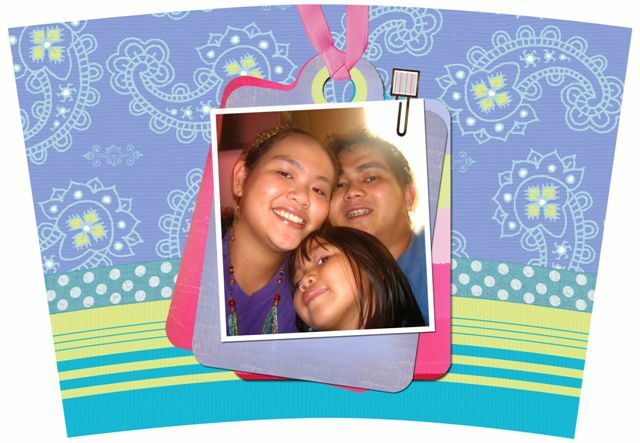 :D But I was soooo busy around that time, that I was only able to make a layout for them this month. Old recipe card from Granny's Pudding Add on Pack 01 by Meryl Bartho. Striped paper from, brown and pink floral paper, pink and brown floral paper with white background, paintchip, pink and brown ribbed papers, dark pink flower chip - all from One by Angela Barton of AngeDawn Designs. Pink tag, eyelet, staple and brad from Sunny Daze Mini-Kit by Nancie Rowe Janitz. Photo prongs from Album Kit. 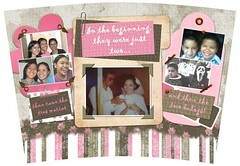 Photo corners from Baby Blues Kit by Valeri Brumfield. And then while I was doing this, Darice was complaining why the hell wasn't she in the layout! 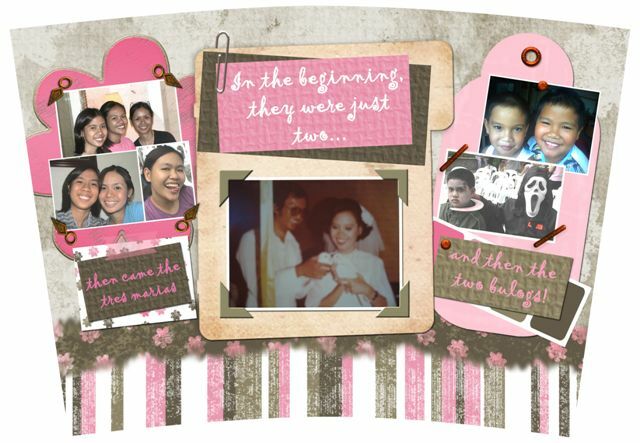 Hahaha, so I made another one for my parents pa rin. 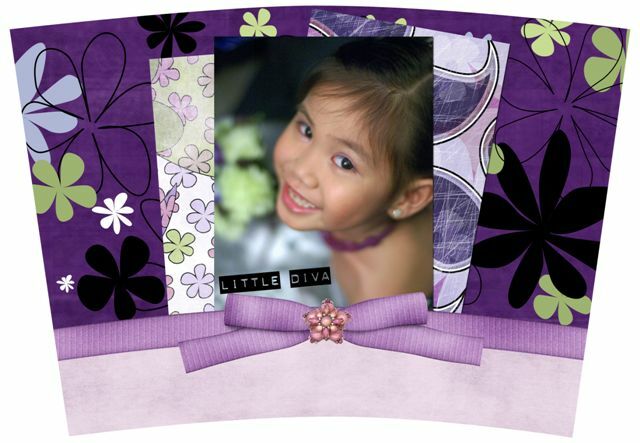 Background papers, ribbed ribbon and bow from Zooey Kit by Clara Wallace of Matterofscrap. Word art from Diva Kit by Daniela Peuss. Pink broach from Little Miss Kit by Dana Robinson. bilib na ko sa yo. you're very creative. i love this customized tumbler. ang gandang pangregalo. so how do you cover up the pictures? plastic cover? hehe. yung starbucks memory tumbler kasi, you can make your own design. just insert the picture/collage, and viola!